Hundreds of thousands of people in Iraq have fled their homes. Help us reach more people affected by the crisis today. Four years of conflict in Iraq has ended, but innocent civilians are still struggling to rebuild their homes and feed their families. Over 2.5 million Iraqis are internally displaced and those who choose to return to their homes are met with the shock of a landscaped changed, and a lack of infrastructure, services and security. The Battle of Mosul was the largest military operation since Second World War. Although the operation ended in July 2017, it left the city completely devastated and 800,000 residents are still displaced in surrounding areas. Over 800,000 residents are still displaced in surrounding areas and 8 million people are in need of humanitarian assistance, which sadly includes 4 million children. Although, as many as two million displaced Iraqis are expected to return to their homes this year, they are in desperate need for food, healthcare, shelter, securing livelihoods and returning to education. In 2017 alone, Human Appeal have helped 750,000 people. This includes providing food for 466,000 people, installing 700 refugee housing units and re-building the destruction of 30 schools to allow 21,000 children return back to their education. Human Appeal are on the ground, however we need your help to reach more people affected by the crisis. By donating towards our Iraq Crisis Appeal you can help ensure that poverty-stricken families can enjoy eating nutritious meals, young children can return to education and safe and stable shelters are built for those whose homes have been torn apart. Your donation can help to start to rebuild the lives of the people of Iraq. Support our Iraq projects and help those who have been left most vulnerable. Together, we can make a difference. Human Appeal is responding to families that have had their houses destroyed and is providing innovative shelters with toilets, water tanks, air-coolers and fire-safety equipment. In addition, Human Appeal is rebuilding and rehabilitating the severely damaged houses for families that have no way to rebuild their homes. £1,500 could provide a shelter to a family. Provision of shelter with latrine, fire extinguisher, air cooler and water tank OR rehabilitation of a war damaged house. For one family – primarily widows and female headed households. As one of the first charities to offer support during the Battle of Mosul, your donations over the last year made a huge impact on Iraqi lives. In 2017 we helped a total of 750,000 Iraqis. During the Battle of Mosul we provided protection-by-presence to over 27,000 people feeling the military operations with the support of UNHCR and our food distributions in Mosul reached the greatest number of people of all agencies. Provided food to 466,000 people. Installed 700 innovative Refugee Housing Units to families living in destroyed homes in Nineveh. Rehabilitated 30 schools in Mosul in time for the new academic year, allowing 21,000 children to return to school for the first time in three years. Provided shelter and other non-food assistance to 214,000 people. Provided clean water to 23,000 people during the Battle of Mosul. Supplied daily food parcel distributions in Mosul, reaching 360,000 people. Delivered Core Relief Items to 125,000 people in Mosul and Nineveh. Provided 8,000 of the most vulnerable households with one off $400 cash assistance package over winter. Provided 15,000 people in camps outside of Mosul with access to nurses and specialist doctors including, a gynaecologist, paediatrician, psychiatrist and minor surgery consultant. Provided 1,850 Syrian refugee families in Gawlian camp in Iraq with daily bread. A shocking 1 in 3 people across the globe suffer from some form of malnutrition – caused by consumption that doesn’t contain the adequate number of nutrients. Just £65 will provide a family of five with enough food for a whole month. To provide access to education for the children of Iraq, most of whom have missed years of schooling due to conflict. £100 could provide access to education for 5 children by contributing towards rebuilding a school. Abu Ali is a father-of-six from West Mosul. His family struggled greatly during the Battle of Mosul - the family home was bombed and left uninhabitable by an airstrike. They lived in their house despite it having no roof or doors. When Abu Ali’s cousin fled the city he was killed and a child from his extended family is still missing. Abu Ali’s source of income – his taxi – was burned by ISIS but he has lucky enough to find daily work to help support his family. Since the Battle of Mosul, his wife has developed diabetes and other illnesses. Abu Ali’s family was one of 700 that we provided with a Refugee Housing Unit, which was designed with the help of the Ikea Foundation. It is an innovative shelter that has a solar energy system, will last four times longer than traditional refugee shelter tents and will protect the family through summer and winter. Abu Ali told Human Appeal. “Before I used worry all night about my children. There was nothing protecting our home, no walls, no doors and no windows. Anyone and anything could enter our home." The solar energy system in Abu Ali’s shelter means he no longer has to pay for fuel or electricity in order to light his home or plug in a phone or television into a socket. 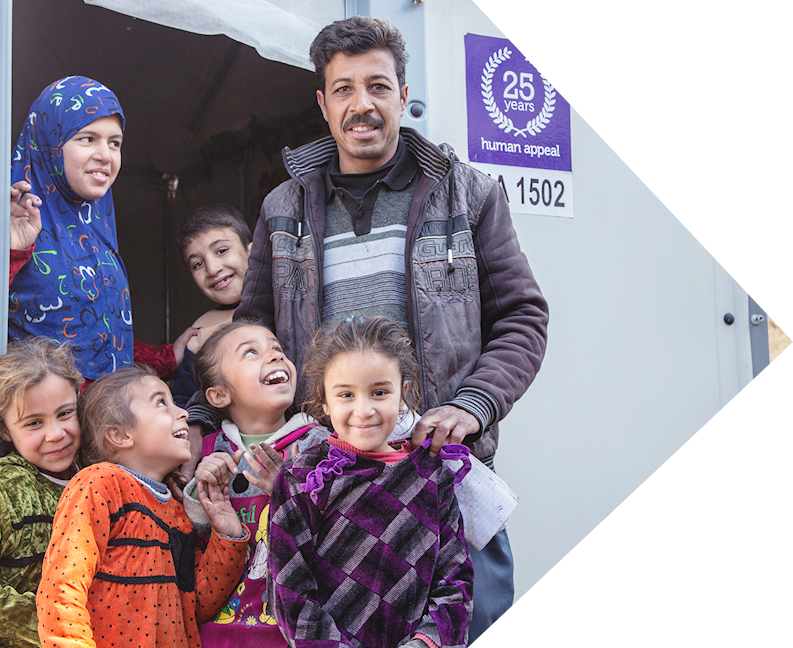 Help more families like Abu Ali’s to receive innovative, safe housing.